The Eldrazi, historically, have been defined by their colorlessness (or at least, their interaction with colorless mana - Eldrazi Spawn and Scions have become almost as iconic as Emrakul, Kozilek, and Ulamog themselves). In the context of Battle for Zendikar, though, colorlessness acts like a color of its own, as we'll see this week. It remains to be seen whether these effects remain iconic of the new colorless mana symbol in the long run, or if they were selected for their particularly Eldrazi-ish qualities. 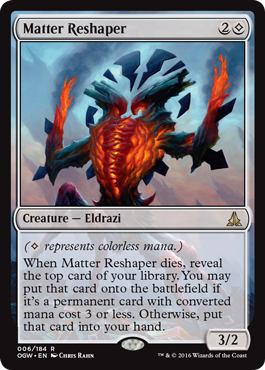 In Matter Reshaper's case, committing to said colorless mana symbol gives you a statistically efficient creature with a powerful death effect - it reminds me of the various cards with the manifest ability word from Fate Reforged, but potentially more powerful in the abstract. Manifesting a Liliana of the Veil or Hero's Downfall often feels like losing a card, but there is no such worry with this guy. He gives an impression of being a modern follow-up to cards like Yavimaya Elder, which invariably died fast but kept you ahead on resources in the long run, and is an even better attacker than many of those past cards. Well this is an interesting pickle. I suggested this week's cards as the so-far "cream of the crop" of the new defined colorless (Read: <>) ....color, for lack of a better term. So, I can't immediately crap all over these. Rats. Anyway, Matter Reshaper. Remember how Bloodbraid Elf ran crazy over Modern awhile back? Yeah, this is kind of her goofy cousin. for the price of admission, it guarantees to replace itself, other by draw or a card hitting the field. The only drawback to a card of this type is the pool you're allotted in the format you're playing. if you're curving out at 3-5, it's amazing. you more or less promise yourself a replacement in terms of field presence. otherwise, it's still pretty good. I wouldn't wait to pick up a playset before someone finds a way to break this card.